This is the final article in a three part series on opioids in Georgia. A patient goes to see a doctor about back pain. Or, maybe he just needs some minor surgery. The doctor wants to help him manage the pain, so a strong pain reliever is prescribed (Vicodin, Oxycontin, etc.). The patient takes the pills and relieves his pain. Before long, he develops a dependency on the pills. Eventually, the bottle runs out. The patient is left with an addiction and seeks out the next available opioid. Sometimes finding another prescription is impossible. So, the patient searches for an illegal option. Like in the scenario above, a doctor’s prescription is often a person’s first exposure to opioids. States across the country are reevaluating how this step in the medical process transpires. 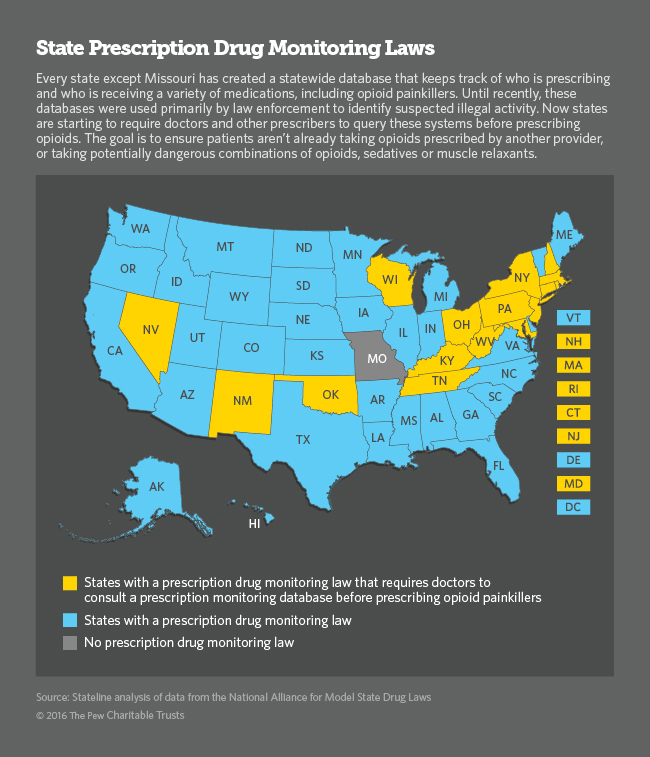 State Prescription Drug Monitoring Laws are laws that monitor the exchange of prescriptions between doctors and recipients. As shown in the graphic below, nearly all states have a database with this information already on the books. States in blue use these databases, but mainly to monitor potential criminal activity. Healthcare providers are not proactive in using the information to prevent “doctor shopping,” which is when patients seek out new prescriptions while already receiving painkillers or other controlled substances from other sources. Some states, including California and Georgia, are currently considering adding these prescription protections. The American Medical Association has endorsed these changes. Individual state groups, like the Georgia Composite Medical Board, have voiced concerns over patient privacy and interference with the regular practice of medicine. Opposition in Georgia also takes issue with other parameters of a bill that has already passed through the Senate. 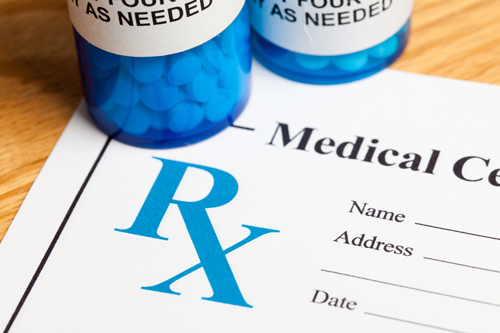 Senate Bill 81 “would require doctors who prescribe drugs like opiates and benzodiazepines to register with a state database that tracks patient prescriptions.” Doctors would have six months to implement the system — regularly registering patients and checking their prescription histories. The most controversial clause goes into action in July 2018. If, starting next summer, doctors “knowingly and intentionally” fail to use the database properly they could be charged with a misdemeanor crime. Supporters of the reform say it would make it harder for those with substance use disorders to freely access dangerous prescriptions. It would also limit the redistribution of those substances into the black market. Also in Georgia, a related issue shifts the focus to opioid treatment centers. As outlined in part two of this series, the state has 67 clinics designated to treat clients with opioid use disorders. This number is high compared to neighboring states like Tennessee with 12 and Florida with 65 (along with a much larger population). Georgia’s clinics are meeting the needs of its residents and those who travel hundreds of miles from out of state for treatment. Still, some legislators, clinic directors, and doctors were in favor of the moratorium that stalled the establishment of new centers for a full year. They cite the risks of methadone and buprenorphine as “replacing one addiction with another.” There’s also concern that some clinics aren’t being regulated carefully enough. Then, there’s the problem of monitoring; when a patient comes from a state like Tennessee, their prescription history isn’t necessarily available in the Georgia drug database. All of these measures are responses to an increase in opioid usage and drug-related fatalities. Many changes will result in better treatment options and more hurdles for access to prescription opioids. Nonetheless, it’s important to stay vigilant. You can pay attention to the way your local and state government handle legislation related to dangerous substances and treatment. You can call your elected officials and voice your opinion if a certain bill will not serve you or your loved ones. Furthermore, you can rely on local, well-established centers like Willingway to provide you with the highest level of care. To find out more about services offered by Willingway Georgia opioid treatment center contact us 24 hours a day at 888-979-2140, and let us help you get started on the road to recovery. Despite Overdose Epidemic, Georgia Caps The Number Of Opioid Treatment Clinics. June 15, 2016. Retrieved June, 2017. Controversy flares over Georgia Senate bill to curb opioid epidemic. February 9, 2017. Retrieved June, 2017. Statistics, Trends and Data on Substance Abuse and Treatment in Georgia. Retrieved June, 2017.